Taking perfect pictures of your baby can be a snap! By learning how to take the perfect pictures for babies you'll be able to preserve precious moments that will last a lifetime. Your new bundle of joy is finally here. He's healthy, happy, and you want to share his cuteness with the world. So, how do you take the perfect pictures for babies? Good lighting is the key to great pictures. Whether you are photographing a 10-day-old or a 10-month-old baby, it's important to have proper lighting. Choose natural light when possible. Using your camera's flash to illuminate a scene will make your subject appear flat. Babies are soft and round. When you shoot with a flash, you diminish that depth. To capture your cutie in the best possible light, move her near a window or lamp. Avoid harsh, direct light. Instead, position your tot so she is bathed in soft light. Using natural light will produce more realistic looking colors, especially with skin tone, eyes and clothing. Your shots will improve exponentially if you shoot them from your baby's eye level. When you take photos standing up with the camera pointing down at your infant, you accentuate the size disparity and provide a detached perspective. Getting down to your baby's level will allow you to capture aesthetically rich images and the distortion will be minimized. If your baby can see you, there is a greater chance that she will make eye contact with you. Place your baby on the bed or on the floor and get close to her. By doing so, you will be able to capture priceless facial expressions at her level. Personalizing your child's photo with props is a great way to create a memorable picture. In addition, it may also help your baby feel comfortable during a photo shoot. However, you don't need to drag your child's toy collection along to every photo shoot; often a toddler playing with an item as simple as a rock can make for a stunning portrait. Babies are phenomenal photo subjects. However, they are often the most challenging ones to work with. This is why it's so important to exercise patience when shooting youngsters. Different kids react differently to cameras. The key to getting a great shot in record time is to make the process as natural as possible. The less a child is aware of the camera's presence, the more natural and expressive he will be. 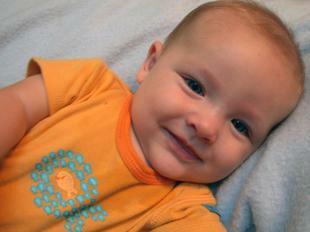 Focus on taking pictures of your baby engaged in everyday activities, such as eating, sleeping or looking at an object. If you are determined to get your little one to look directly at the camera, then ask others to call your baby's name, wave a toy or shake a rattle near the camera. You don't need to invest in an expensive camera to capture cute shots of your baby. You can get away with owning a moderately priced camera, provided you know how to use all of its features to your advantage. Read your owners manual carefully and familiarize yourself with your camera's capabilities. Telephoto lens--A long lens comes in handy when you don't want the baby to be aware of your presence. If you are not invading your child's space, she can carry on with her activities and you will be able to capture charming photos with natural expressions. Tripod--Floor standing tripods can be purchased for less than $30. This small investment will yield big payouts in the form of sharp images of your baby. Without a tripod, you run the risk of shaking the camera, which results in blurred shots. Babies grow up fast, so focus on capturing as many shots as you can now. Doing so will help you remember the magic of childhood long after your kids leave home.